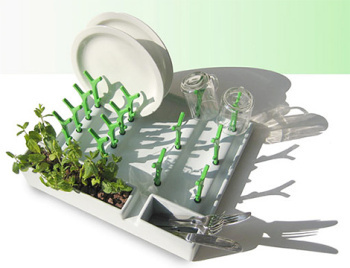 Innovative Dish Drainer with HerbsWhat is so interesting about this dish drainer? A boon for all those with green thumbs and other body parts, this innovative dish drainer lets you grow herbs on your kitchen counter without having to take the time to water them. Great for multi-taskers, this innovative combo kitchen gadget is designed as a sturdy rust-proof, spill-proof draining stand for washed dishes, glasses, mugs and silverware, but that’s where its similarity to other dish drainers comes to an end. This dish drainer has an ingenuous twist that no one else on your block could ever have thought of! The draining dish comes equipped with a little herb planter on its side that turns the dish drainer into a lovely indoor planter that grows fresh herbs. How did this dish drainer come to be? This brilliant dish drainer was the creation of Ran Shapner, an outstanding student at Holon Institute of Technology, which is one of two institutes of higher learning in Israel offering career training and research in the fields of engineering and technology. With all the emphasis on green, sustainability and reducing carbon footprints, this innovative dish drainer design is sure to be a winner and a must have combination gadget for the modern kitchen. The assumption is, of course, that whoever buys this dish drainer will wash their dishes and not leave them lying around. But perhaps other thing could develop from that scenario as well. Anyone out there remember how penicillin was discovered? Aqua Sand: Sand That Never Gets Wet? For $20 You Can Have Your Own Donut Factory! Of course, I'd probably kill my herbs, but still, smart. okay, great idea, but what about light? ktichen neon light don't fit for growing herbs or plants. You have a point. I didn' think of that! I know what you mean. I have no luck with growing herbs. i don't think they like me.